Santoni Toft and Tanton Driving Shoes – New for Spring! The new Spring/Summer lines are here and it’s time to have some fun with the best shoes in the world. 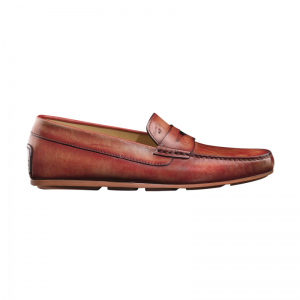 Santoni decided to bring in a fresh interpretation of the ever popular Italian driving moccasins. The Tanton is an abosolutely gorgeous hand antiqued driving shoe with penny loafer construction. The Toft is a perforated driver, made famous by brands such as Moreschi, and features bow tie detailing, contrast color stitching to make the look really pop. The Toft is available in both Brown (pictured) and Blue. Both Tanton and Toft feature a comfort driving sole, so they’re perfect for all day wear, long walks, long driving. 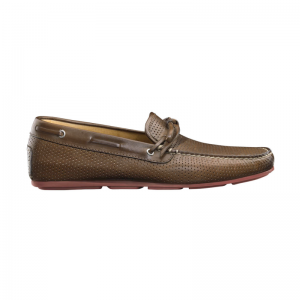 Truly a moccasin that will set your wardrobe apart this season.